Back in October the girls had an evening swim meet. It is definitely a fun meet for them so to add to the fun I thought it would be even more fun to get some moms involved in a moms vs coaches relay. Let's just say it was loads of fun and even though we lost and it taught our kids a thing or two about what their mamas can do. I must admit I'd been hatching this idea probably since the end of summer because I knew I need so swim savvy moms if we were to even have a shot at this. After pitching the idea and a little bit of pleading we were in. Next thing we needed was a team cap. 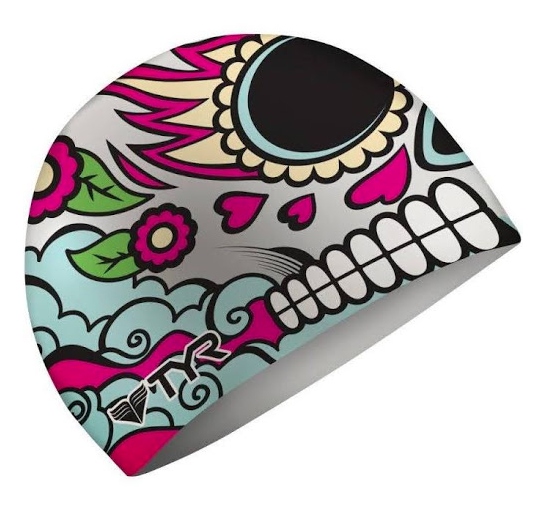 Well apparently #swimmoms or anything related to moms swimming cannot be found printed on a silicone swim cap (though there is an array of nice shirts). So the next best thing is... typing 'swim mom cap' into Google and seeing what appears. Wouldn't you know these were the caps that came up. I mean they had flowers and hearts on them and they seemed fierce enough and the name of them is La Vengadora - Lady Avengers so here we were. Then it came to the morning before the race. We assembled at 5:30 (in the morning because everyone knows that's when moms really have quality time for themselves) to practice diving off the blocks. Ummm.... let's just say having not dove off one of those blocks in 20 years - they were really high. And here we moms are telling our kids they have nothing to worry about and get up there and just do it. Well then it was race day - which was kind of hilarious because there was this series of serious texts about our order but also included who was going to be in our cheering section because word had gotten out about the #swimmoms and even non swim friends were wishing us luck and then dying to see the video of it after the fact. I mean Lee and my mother in law even stuck around until 7:30 with all the kids - hello past your bedtime A and C - to watch. D. One of teammates rang in her birthday swimming on the relay team - which was AWESOME! On that note, I cannot speak for all the #swimmoms but I hope that we can have a rematch next year. Hopefully next year the coaches team will have a closer median age to our as they were about 7 years younger than us on average OR we need a handicap based on the number of kids we have. Once the race was over, we looked around at each other and determined that there are 15 kids between the four of us!